I stopped by a nice nature area near Boykin Springs in Jasper County Texas on the way home from a class in Saratoga, Texas. I was surprised to find the Bachman’s Sparrows singing well into the afternoon. I stopped at this one location and heard 3-4 at close range ( 20-30 feet), 4-5 at moderate range ( 30-60 feet) and several further away. Bachman’s Sparrow is endemic to the United States, occurring nowhere else. Near Overton Texas and the Rusk County – Smith County Line, in Smith County. I visited the Upper Texas Coast April 15-April 19. First Stop was Brazoria National Wildlife Area in Brazoria County Texas. Here is a 2 minute recording of Frogs, Toads and Insects heard at a marsh in the refuge. There was quite a bit of wind and I used a leveler filter to try to mitigate some of the wind noise in the recording. The Gulf Coast Toad sings near the end of the recording. I recorded a few birds today at a local park in Gregg County Texas. American Robin singing from a branch over my head. A Carolina Wren and a Brown Thrasher were having a singing contest. The evening of March 7 was warm following days of freezing cold, ice and heavy rains. The warmer evening brought out choruses of frogs all around the area. These calls were recorded at a small pond just north of town on a rural road. This is a 9 minute recording. https://yhgail.files.wordpress.com/2015/03/recording-28-entire-mar-8-2015-n-longview-peepers.mp3Spring is bringing out a chorus of frog calls in NE Texas. I drove small roads north of Longview and found many places with load choruses of Spring Peepers and Southern Leopard Frog. A flycatcher type call can be heard at the beginning of this recording made during the run of my Crossroads BBS route, 2014. The route was run on Sunday, June 8. The flycatcher song sounds three times at the beginning of the recording and again toward the end. After the 4th call a White-eyed Vireo song begins. 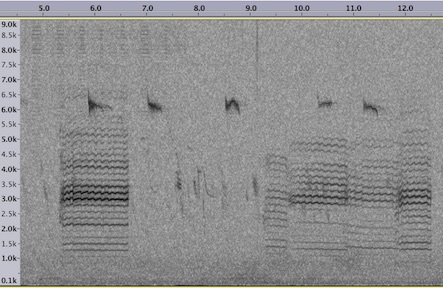 The flycatcher song does not match any possible migrant or breeding flycatcher. I suspect that the song was made by the White-eyed Vireo song that follows the 4th call. There were no more flycatcher song segments but the White-eyed Vireo continues.